For over 30 years, Mr. Schwartz has produced unique and compelling designs of shoes, considered by him to be the most artistic and important accessory in a woman’s wardrobe. His shoe designs have graced the runways of Paris, Milan and New York, as well as the pages of fashion publications such as Vogue, Elle and W Magazine. As a young man in the early 1980’s, Mark Schwartz launched his shoe design career by assisting shoe design master Roger Vivier, and within two years Mr. Schwartz rose to become the creative director for Roger Vivier International. Mr. Schwartz aided with the design of many eclectic collections during his 7 years with the company. 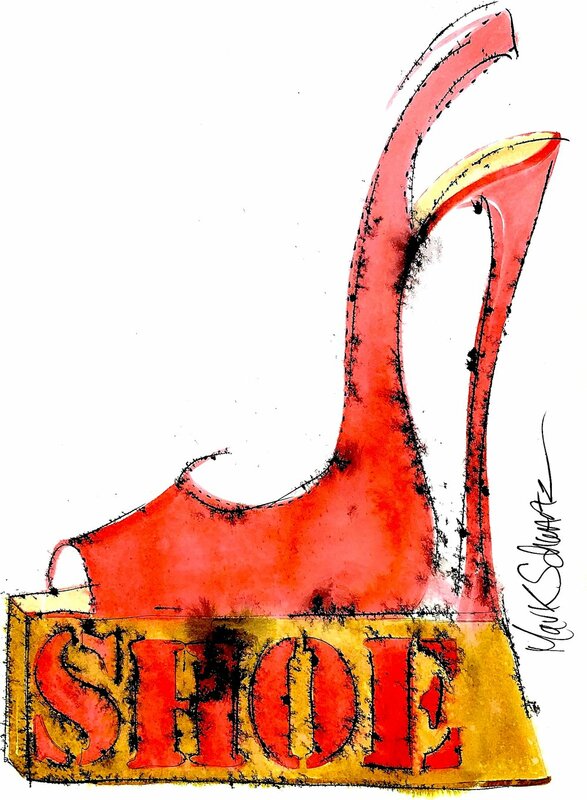 Roger Vivier introduced Mr. Schwartz to many of the influential players of the 1980’s New York art scene, most importantly Andy Warhol, who mentored Schwartz until his death and was the one who urged Mr. Schwartz to paint his shoe designs. Schwartz and Warhol would meet two or three times a month to exchange ideas and talk about shoes and art. Warhol was a huge influence on Mark pushing him to come up with creative ways to do paintings that included shoes and leaving a strong artistic imprint that Schwartz still uses today in all of his work. An accomplished footwear designer, Mr. Schwartz has designed shoes for Barney’s, Bergdorf Goodman, Cleo Bottier, and Neiman Marcus. Mr. Schwartz has collaborated on design projects in the past with Balenciaga, Chanel, Gucci, and Jean Claude Jitrois, Ralph Lauren, Alexander McQueen, Marc Jacobs, Christian Lacroix, Hermes and Bill Blass, Richard Tyler and Calvin Klein. He has made shoes for Oprah Winfrey, Madonna, Julia Roberts, Sharon Stone, Julia Louis - Dreyfus , Natasha Richardson, Tina Turner, Lady Gaga, Katy Perry, Jennifer Lopez , Halle Berry, Angelina Jolie, Hillary Rodham Clinton, and Wendy Williams.